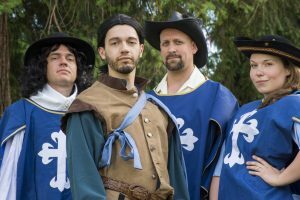 Chris Allen (Aramis), Ben Symons (d’Artagnan), Daniel Wood (Athos), and Abby Nathan (Porthos) will have a sword-ed summer in GreenStage’s The Three Musketeers! Photo: Ken Holmes. Seattle-area parks will resound with the clanging of swordplay this summer as GreenStage’s production of The Three Musketeers makes the rounds. Director Erin Day says there’s a lot to love about the popular story. We open July 13. Go see a play!